There are many benefits that come with buying assets overseas, whether you’re investing in a place to retire or simply taking advantage of foreign markets. You’ll achieve true investment diversity, benefiting from not putting “all of your eggs in one basket”. Eventual retirement will be remarkably cheap. You can take tax deducted trips to manage your assets. It may sound like obvious advice but, depending on the reason you’re buying, it may not be so straightforward. Say you’re purchasing a holiday or retirement house in a foreign country. You’re not trying to make money, and so you may want to ignore current and future market trends. However, every investment should be financially sound, as even the most innocuous purchase can have disastrous consequences on your pocket. For example, buying property in Spain or investing in the Israeli real estate market at the moment is a good investment. Property prices are down but show strong signs of recovery. But don’t make the mistake of buying assets in Greece, no matter how picturesque. You risk landing up with a house in a country in which it is not financially viable to live – and you’ll be unable to offload it. Asset ownership laws are not universal. There is a huge range of clauses and loopholes that could trip you up, from owner responsibilities to inheritance laws. Furthermore, the original owner knows the legalities far better than you do and will have their own lawyer advising them. It’s in your best interests to find an independent lawyer, who is on your side only. They will be able to fill you in on details you might have missed, clarify confusing clauses, and represent your interests in negotiations. Make sure to do your own research on your options of legal representation. Find someone experienced in asset sales and who has professional indemnity. Also, ensure that they are licensed to practice in the country of your purchase. View our top property investment blog list here. When buying a property, the benefits you see may be dependent on the time of year and the circumstances in which it is being sold. But there could be many pitfalls the seller is keeping from you – the property may be fine in summer but flooded in winter; there may be regular electricity shortages; crime may increase during the holiday season. Speaking to property owners nearby can go a long way to uncovering any potential pitfalls that are currently not apparent. Try to ensure that they too have no financial interest – in an increased value of their own property – in your purchase. When transfers are made through banks, fees and currency exchange take a big chunk and you end up paying far more than the actual price of the asset. Secondly, banks charge fees at a much higher level than foreign exchange companies. Transfer fees, commissions, and receiving fees will all be minimal or non-existent when you use a foreign exchange company. Banks demand higher fees on all transfer costs as it is not their primary avenue of business. 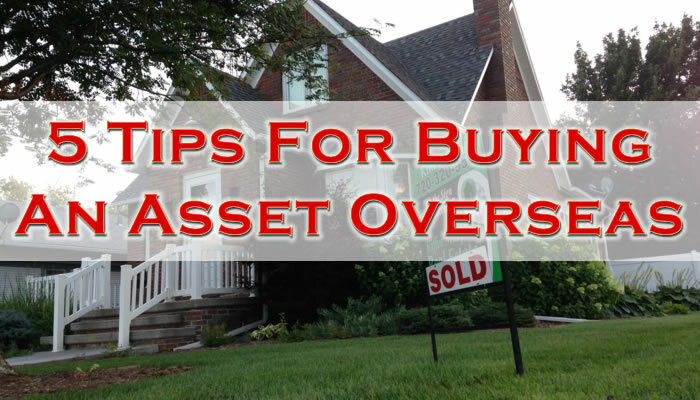 Buying foreign assets is an excellent idea – if it’s done correctly. Always approach these investments prudently, and with sound guidance from the best financial advisors. Make sure to take these 5 tips into account, and you won’t go too far wrong.